The mission of the Los Angeles Airport Peace Officers Association (LAAPOA) is to maintain a leadership role in organizing, empowering and representing the interests of all current and retired members. To facilitate a member driven organization that promotes public awareness that encourages and upholds a professional image to the aviation community and public at large. To preserve an environment in which members interact and work towards achieving common goals and objectives; define and enhance standards for professionalism. To advocate for ensuring the latest training and equipment is identified, provided, and implemented for all of its law enforcement and public safety professionals. 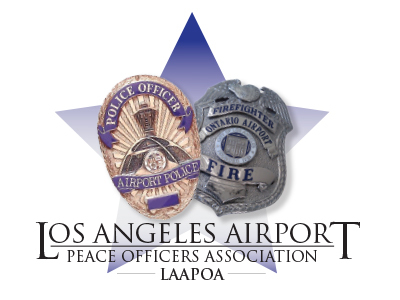 The Los Angeles Airport Peace Officers Association (LAAPOA) represents the sworn police officers and firefighters of the Los Angeles Airport Police Department assigned to protect and serve Los Angeles International Airport (LAX), LA/Ontario International Airport (ONT), Van Nuys Airport (VNY) and Palmdale Regional Airport (PMD).